“As a 64 yr. old active woman with dry, aging skin, I used to cringe when I caught a glimpse of my face in the mirror with my reading glasses on. No longer! I can actually see an improvement in the fine lines and wrinkles, especially around the eyes. I have been using Seraj Citrus moisturizer for about 6 months and would recommend it to anyone as a completely natural and effective moisturizer. “Our son has suffered from eczema and severely dry skin since he was a baby. We had tried countless creams and lotions but nothing seemed to work. He would often refuse to have lotion applied because it would sting his skin or make it itch even more. One day Sheryl noticed his legs had many red welts and scabs from him scratching so badly. She asked if it was okay to try out some of her cream on him. Right away I knew she was onto something when he didn’t complain and actually said it felt good! By that evening we could see improvement and after a few days of using the cream his legs had completely cleared up! Now he not only lets us apply the creaam, he asks for “Miss Sheryl’s Magic Cream”! “Sheryl, thank you for my product, “Seraj”. 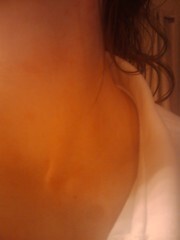 My daughter came home from camping and her lips were terribly burnt. She had been exposed to the outside extremeties for several days. When I saw her, I could just see the burn and hurt feeling on her face. She even had the burn ring around her mouth. That very same night, I put some “Seraj” on her lips and chin while she was sleeping. The next morning, she woke up feeling just great. She was able to talk normally and her mouth felt good. The burn ring was just about gone. “I was like many people out there today, tired of buying different creams all the time and spending an enormous amount of money along the way. One for make-up remover, one for everyday use, night use, dry skin repair, and it never ended, until I met Sheryl. She had introduced her product to me in August 2009 for excessive dry skin. Never in a million years did I ever think I would come across a product that works for anything from dry skin and infant diaper rash to an everyday use cream I can use for EVERYTHING! Little did I know the true test of the product was just around the corner. After using it for about 3 months, we went to a family reunion and slipped and fell against a very rough edge with the side of my neck and shoulder and had a very large scrape all across the left side. The day after it happened I felt I would have a scar for the rest of my life. Sheryl came to me that day and told me to try her all natural Seraj cream on the scrape. She assured it was all natural and organic and with all of the wonderful ingredients she uses while producing the product, she was sure it would help. 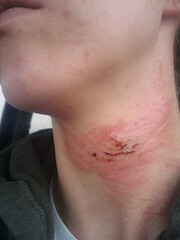 I used it for 6 days after the accident and on the 7th day my neck was scar free and pain free. You would have never known a week after using the product that something had happened the week prior. I LOVE this product and tell everyone about it! My personal experience with Seraj and eczema. I have an eleven year old son, we have struggled with eczema from the neck down almost since birth. I have tried numerous products over the years, anything from creams, lotions, ointments and also “all natural” products. from health food stores and various vitamin “places”. The problem I would have mostly in the summer months, when my son would spend a lot of time outside in the sun, wearing sunscreen. His eczema would be at its worst. I would apply these lotions and creams, and my poor son would cry in pain, saying his skin was burning. I would immediately have to bathe him to soak the product off his skin. All that has changed since we have started using Seraj. Now he will come ask me to rub him down with “Sheryl’s stuff”. 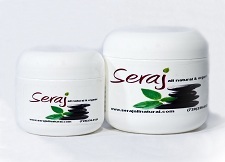 Since using Seraj my son’s eczema is practially gone. I cant begin to tell you how much we love this product. My only wish is that Seraj was available to us much sooner in my sons life, it would have saved us a lot of frustration and heartache. Thank you from the bottom of my heart, Sheryl for creating Seraj! a true customer, Jodi D.
The Seraj cream helps me every day. It remedies dry skin, brown spots on my face, wounds from yard work. Use of the cream takes away pain instantly and healing is rapid. Patches, my cat, has had two visits to the vet to drain abscesses. Using the cream helped to keep the openings soft and infection free. My newly adopted puppy will soon need to be spayed. I know the cream will help the discomfort after her surgery. I’m so grateful to you and in awe of your ingenuity, skill and dedication. After 12 years of suffering from extreme eczema on my hands, and countless prescription as well as over the counter products…I’ve finally found something that’s cleared up this painful problem. My condition was severe: thick callused, cracking, bleeding and itching. What a relief to be able to shake hands with people, hold hands with my husband and that I dont have to hide anymore. I love that I can even hold a pen or fork without any pain from eczema. Please don’t stop making these products. Thank you, thank you, thank you.